How will the hosepipe ban affect my swimming pool? Seven water companies across south and eastern England are introducing hosepipe bans from Thursday, 5 April 2012. The ban prohibits the topping up of a domestic swimming pool in these areas. This article gives you more information on how it might affect you. Anglian Water, which covers much of the east of England (its Hartlepool Water subsidiary is not affected). Southern Water; which has customers in both Kent and Sussex. South East Water, which covers areas in Kent, Sussex, Surrey, Hampshire and Berkshire. Sutton and East Surrey; which operates in east Surrey, and parts of West Sussex, west Kent and south London. Thames Water, which covers parts of Greater London, the Thames Valley, Surrey, Gloucestershire, Wiltshire, and Kent. Veolia Central, which covers parts of northwest London, Surrey, Beds, Bucks, Herts and Essex. Veolia South East, which covers southeast Kent. In these areas, the hosepipe ban means that after the 5th April 2012, your swimming pool cannot be topped up directly from a hosepipe although you can fill or maintain a pool “using a hand-held container filled with water drawn directly from a tap”. Hot tubs and spas are not covered by the ban and can be filled and topped up in the usual way although if you have a Swim Spa, that does fall into the same category as a swimming pool. If you are having a new pool built, a Swim Spa installed or your existing pool relined or refurbished then you are exempt from the hosepipe ban as far as filling it is concerned, but once full you will need to maintain the water level using the handheld container method. How can I save water now and in the future? The UK drought has focussed everyone’s attention on how much water we use and whether we should try to be more efficient and economical with water. If you have a pool and particularly if you are on a metered water supply there are certainly some things you can do to save water and money. A well fitting, good quality pool cover is the first thing to look at as they not only help retain heat – and therefore save on your energy bill – but they also reduce water loss from evaporation meaning that you have to top up your pool less frequently and you also need to use less chemicals. You should ask your service engineer to check for leaks or you could check for leaks yourself. 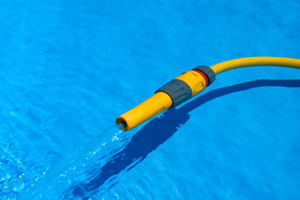 There is a wide range of repair products on the market for all types of pool or, of course, if you do find a leak you can ask your service engineer to look at it. In the longer term, it might be worth considering some of the new technology that has become available such as the MultiCyclone, which can be fitted to new or existing pools and will save thousands of litres of water a year while helping the overall efficiency of your filtration system. If you would like some specific advice on water saving or leak repair and would like to find an appropriate pool professional in your area, there is a contact button to the top of this article that can get that process started. As of the 13th June, three water companies lifted their hosepipe bans. The move by Anglian, Southern and Thames came after flooding in England and Wales, with more heavy rain forecast and flood warnings in place. South East Water, Sutton and East Surrey Water, Veolia Water Central and Veolia Water Southeast have confirmed their bans will remain in place due to low levels of groundwater but would continue to monitor the situation and keep the restrictions under review. 2 Responses to How will the hosepipe ban affect my swimming pool? can i fill up my pool with a hosepipe, i live in ipswich, i see the ban everywhere else but not here? Unfortunately your area despite all the rain is still subject to a hose pipe ban at the moment which means that you can’t top up an existing pool with a hosepipe. What you can do though is fill a bucket or other hand held container from a tap and use that. If you are having a new pool built then you are allowed to fill it up using a hosepipe but then have to revert to the bucket method from then on. The other exception is if you are having major repairs such as a new liner fitted or having the surface repainted and then the same rules apply. Now that it’s autumn, it is time to winterise your pool. What can I do to make my pool more environmentally friendly?